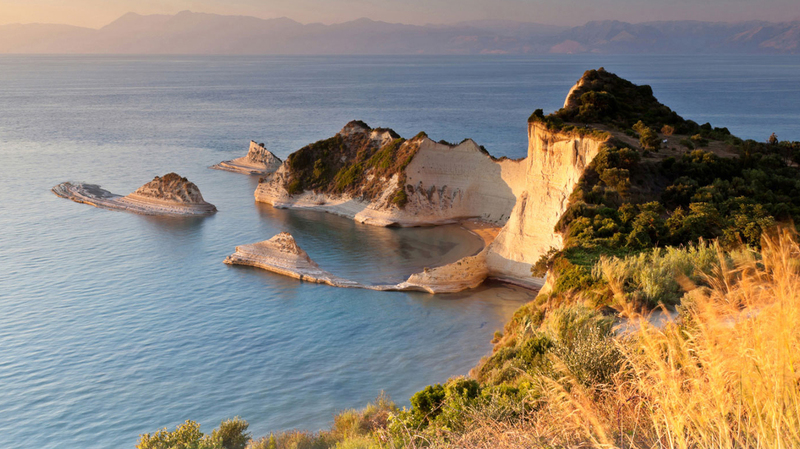 Search for the best flight prices from Manchester to Corfu. Compare prices, book today and save money with Manchester Airport. In the crystal clear waters of the Ionian, Cofu has variety at every turn, from heaving, neon-decked resorts in the south to sheltered coves and deserted beaches in its mountainous north. Take a trip offshore to spend the day on nearby Paxos and tiny Antipaxos for a different, more unplugged version of Greece. Hotels are scattered across the island, behind the popular beach resorts, and also in the elegant capital, Kérkyra. A top choice in town is Bella Venezia Hotel (N. Zambéli 4), just three floors of rooms installed in a neo-classical former girls’ school. A short way west of Kérkyra, the five-star Kontokali Bay Resort & Spa has its own gorgeous beach and appeals to families. Above Pélekas, affordable Levant is built in mock rustic style, with sweeping views east and west, marble and wood everywhere. In northwesterly Ágios Stéfanos, Delfino Blu overlooks an excellent beach and presents boutique standards in its pastel-hued units, with a gourmet restaurant downstairs. Kérkyra Town offers the best shopping opportunities. Quality leather articles can be found along the main pedestrianised street Nikifórou Theotókou, while silversmiths cluster along its parallel Evgeníou Voulgáreos. Famously innovative jeweller and goldsmith Ilias Lalaounis has an outlet nearby (Kapodistríou 35). Prime stop for aficionados of Greek music should be Ihos 65 (Agíon Pándon 4), with genial Marios Tsangarakis the second-generation proprietor. With a landscape mantled in olives, olive-wood souvenirs are ubiquitous, though more along rural roads than in town. Unusual recipes, an often demanding wealthy clientele and varied local ingredients make Corfu a top foodie destination. Doyen of the town restaurants has to be pricey Rex (Kapodistríou 66), with creative Mediterranean recipes. Around the corner, ideal for a budget lunch, long-running Khyrsomallis (aka Babis; Nikifórou Theotókou 6), serves all the Greek casserole standards washed down by smooth but potent barrelled wine. For seafood, look no further than Klimataria tou Bellou (main square, Benítses) or Boukari Bay (Boúkari shore road), while Foros does hearty country fare in the renovated Mt Pandokrátor village of Paleá Períthia. For three weekends, fancy-dress parties, floats and filarmonikés (brass marching bands, a Corfu speciality) take over the streets of Corfu. The trial and cremation of the ‘King Carnival’ effigy takes place on the third Sunday. The most extravagant observance in Greece. The Good Friday eve procession of the Epitáfios or Christ’s funeral bier is accompanied by dirges from various filarmonikés. Saturday morning sees pottery hurled from upper stories (to banish bad luck), before the midnight Resurrection Mass, accompanied by spectacular fireworks displays. Paleokastrítsa hosts Corfu’s biggest summer spectacle, with musical performances at dusk, while after dark there’s a re-enactment of Odysseus’ battle with Poseidon and discovery by Nausikaa, before small, torchlit boats enter the bay, fireworks soar skyward and a beach party kicks off. Against all odds, and constant funding difficulties, this annual, one-day ‘Corfu soul, rock and folk festival’ keeps going strong. It takes place in the mid-island village of Ágios Ioánnis. On Palm Sunday, Easter Saturday, 11 August and the first Sunday in November, the relics of Corfu’s patron saint go walkabout through Kérkyra Town streets, in thanks for the several times ‘Spyros’ has saved the island from disaster.